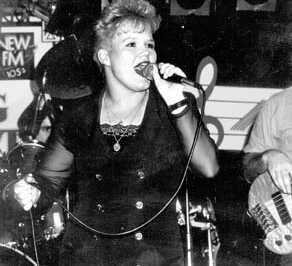 FRIENDS and followers of late vocalist WENDY MCMASTERS will gather at Adamstown RSL Club on Wednesday, December 20, at a fundraiser for the singer's family. McMasters, 27, died on November 20 while undergoing an operation as a patient of the intensive care unit at John Hunter Hospital, after suffering a brain haemorrhage a week earlier. The vocalist, most recently from SKREEM and formerly of KDENCE, CLASSIC JACK, BIG CHILL, M15 and STIR CROWD, is survived by her husband PETER SNEDDON, and two young children Daniel and Katie. The fundraiser will feature the bands GOLD CADILLAC, BIRBEN VARIETY BAND, JUST FOR KICKS and V8 SWINE, who have all donated their talents to raise money for the family. Band colleague and friend JOHN CARRUTHERS said McMasters spent her whole life singing in bands. He said McMasters, who also worked at Klosters Motors, was the family's main provider. 'Wendy's husband Peter may perform a GARTH BROOKS song THE DANCE on the night, which I believe had great significance to them both,' he said. Peter's rendition of that song has been recorded and will feature on a six-track CD containing vocals by Wendy McMasters, her only recording effort. The CD, featuring covers of songs by ALANIS MORRISSETTE, NATALIE IMBRUGLIA, TONIC, MELISSA ETHERIDGE and THE CRANBERRIES, will be sold on the night.